I'm entertaining my bridge club tomorrow afternoon....would love to hear the interview on the website....enjoy...bet it will be great. 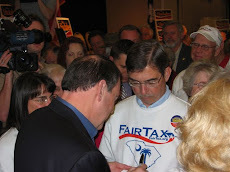 I got a chance to listen to you on the radio giving the overview of the FairTax. I wish they gave you more time to explain its many benefits but it was good to see the support on the station for it. Do you know of any legislator in CT(the bluest state in the US) who supports it?? You did a great job just now talking to Anna Little. 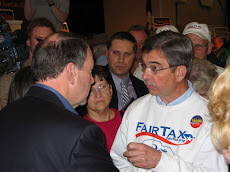 You have such a good "radio voice", I think that they should hire you to be National Spokesman for the FairTax! You have a nice friendly tone to your voice, you articulate well and you don't come across like a snobby "know-it-all". PS. Tell Carol I like her too!